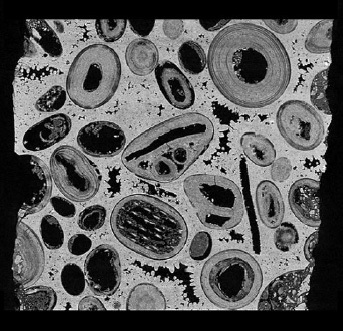 The image quality that can be achieved with micro-CT (X-ray tomography) is closely related to the size of the sample. In some cases the required image quality and sample volume are not compatible. This problem can be solved by combining scan data acquired at different resolutions from different sample sizes. For any sample with a given dimension, the image pixel size depends on both the system geometry and the application. The principle of computed tomography involves accounting for all attenuation coefficients of the material in the beam path. Material outside the field of view (truncated scanning) contributes to the attenuation only at certain angles. This leads to a misrepresentation of the greyscale value in the micro-CT image. Information from truncated scanning can be used for qualitative analysis. However, in a truncated scan there is no quantitative measurement of the amount of X-rays absorbed, and therefore no information about density. While morphometric analysis can be performed on truncated scans, density measurements require the sample to be scanned within the field of view of the camera. The image pixel size depends on the system geometry: camera pixel size, and the distance between camera, object and source. 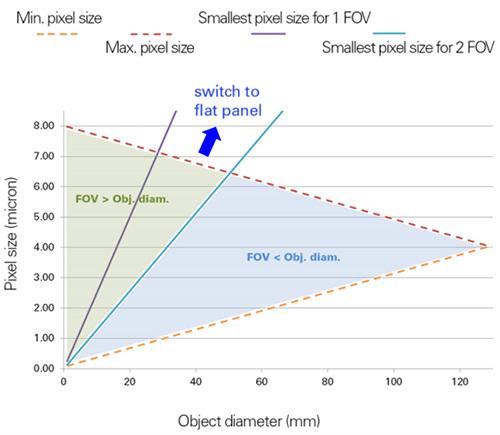 A smaller pixel size can be achieved by moving the sample closer to the source. Zooming in is also possible with offset scanning, where the camera moves horizontally between two positions, and stitching the images together automatically. Higher resolution can also be achieved with truncated scanning. Even more is possible with adaptive geometry, which is can be performed with the Bruker SkyScan 1272 and 2211 micro-CT scanners. How to achieve the highest possible micro-CT resolution. 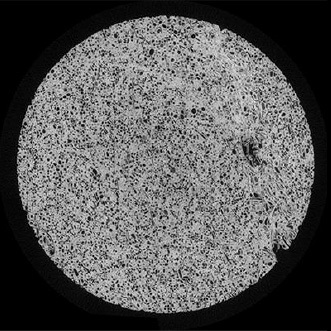 Image pixel size versus object diameter for the CCD in the multi-scale Bruker Skyscan 2211 micro-CT. The image pixel size gives the first indication of the resolution that can be achieved. The attenuation of the sample must also be taken into account. In principle, if the sample composition (physical and chemical) and the system characteristics (X-ray beam energy profile, detector sensitivity, etc) are known, the image resolution can be simulated. However, in the majority of cases, this is determined empirically or estimated based on previous experience. Often in core analysis, CT scans from two and more length scales are combined. In the images above, a geological sample of Savonniere limestone was scanned at three resolutions. The images show a ~38mm diameter plug, a ~9.5mm diameter plug and a cuboid with a ~2.5mm side. The respective image pixel sizes are 22.0µm, 5.5µm and 2.0µm. 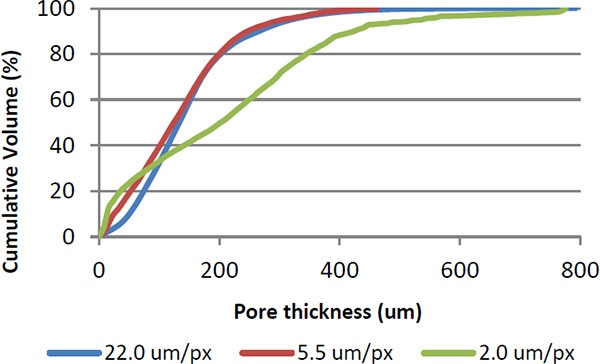 The graph below shows the cumulative volume of the pore thickness. Information extracted from multi-scale analysis of various length scales can be combined to quantify and model the overall sample behaviour. 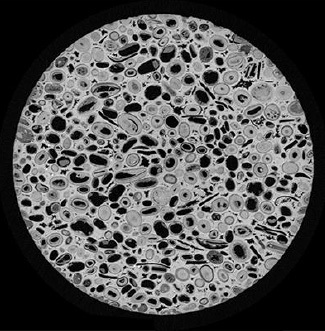 If you have any questions about multi-scale micro-CT analysis, and whether it would be suitable for your research, please contact us to discuss your application. Blue Scientific is the official UK supplier of the full range of Bruker SkyScan micro-CT instruments.